Determined that the historic injustice to Africa is urgently addressed and the continent given the full representation it deserves at both categories ( Permanent and Non-Permanent ) of the United Nations Security Council , Sierra Leone’s President Ernest Bai Koroma took another staunch stance at the recent summit of C10 held in Malabo, Equatorial Guinea, according to news coverage from some international African newspapers. As Chair of C10, the African Union Committee thrust with the responsibility to canvass and promote support for the African Common Position in the UN Security Council Reform, President Koroma has had a very busy two years attending meetings and summits and even visiting stakeholder countries to continue canvassing support for Africa’s position , as he had been doing since he came to power in 2007. The UN Security Council Reform will be one of the enduring legacies of the President Koroma rule , as his tremendous work will be forever remembered , leading ultimately to the reform, even if it does not happen while he is still at the helm. A communique signed by the C-10 heads of state praised President Koroma highly. Heads of state serving on the African Union’s Committee of Ten have proposed a boycott of the United Nations General Assembly if their longstanding expectation of permanent representation on the UN Security Council is again disregarded. The summit, completed in Equatorial Guinea on Wednesday, brought together members of the African Union Heads of State on the Reform of the United Nations. The C-10 committee has since 2005 pressed for two permanent member seats on the UNSC, and two additional non-permanent seats, to reflect a more inclusive participation of African Union (AU) member states in the council’s authority. President Ernest Bai Koroma of Sierra Leone, the chairman for C-10, made the suggestion during the meeting in Malabo and his nation presented a statement on the position. 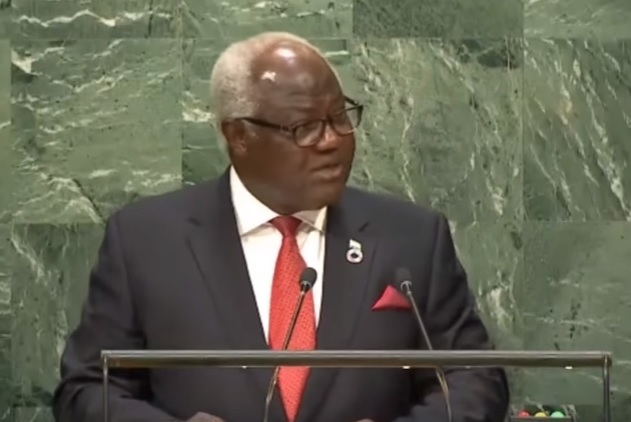 Koroma was joined by other leaders, including President Hage Geingob of Namibia, who expressed their frustration over the barriers to finding seats for Africans at the UNSC table. Geingob told Namibian Broadcasting Company that it was unacceptable that a continent with more than a billion global citizens still has no representation on the Security Council. Other African leaders attending the meeting include President Edgar Lungu of Zambia, President Denis Nguesso of Congo-Brazzaville, and host President Teodoro Obiang Nguema Mbasogo. Original C-10 member nations also include Senegal, Uganda, Algeria, Kenya and Libya. They are tasked with pursuing the goals of the Ezulwini Consensus, also known as the African Common Position, on the UNSC reform issue. A new framework to advance Africa’s standing is expected to be discussed at the AU summit in summer.